A stud is basically a threaded rod. It is screwed into a threaded hole with a length of the studs remaining exposed. The mating part is put into place over exposed portion of the studs and bolts are tightened on the stud against the mating part to hold it in place. 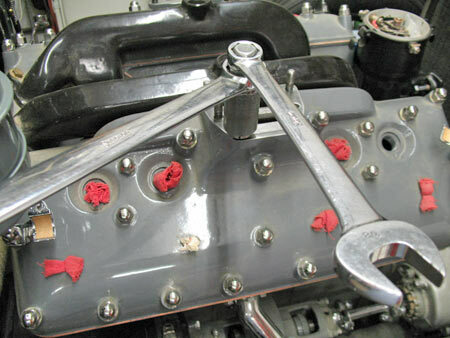 Engines, transmissions, and other components often use studs for fastening to a mating surface. Threaded holes are made into a surface during the manufacturing process. On an engine, you will commonly find studs on oil pan surfaces, transmission bell housings, and intake and exhaust manifolds. Studs can be in both coarse (also called US Standard (USS)) and fine thread (Society of Automotive Engineers (SAE)) or a mix of both coarse on one end and fine on the other end. Sizes are: 1/4-20, 1/4-28, 5/16-18, 5/16-24, 3/8-16, 3/8-24, 7/16-14, 7/16-20, 1/2-13, and 1/2-20. In certain applications, studs can be in mild steel to hard grade 8. 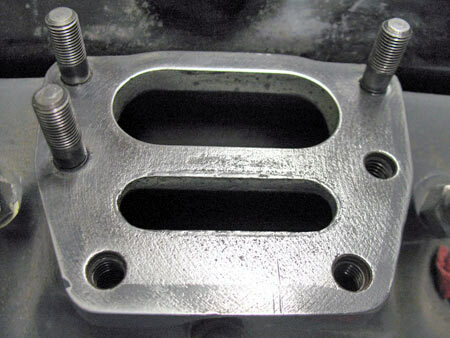 Here we cover the process of reinserting studs in a special water and intake manifold. 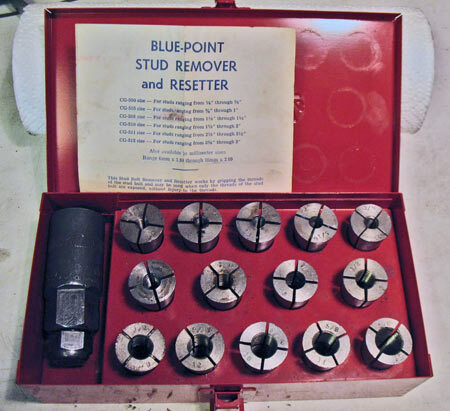 We will use the remover set from Blue Point Tools, the trade name for Snap-On Tools (Photo 1). We have already removed the studs, and the manifolds have been cleaned, painted and surfaces prepared. Photo 2 shows the manifold's surface with some of the studs reinserted. The proper collet is selected for the thread size and inserted into the collet holder. Photo 3 is the stud in the collet and holder along side a stud for comparison. 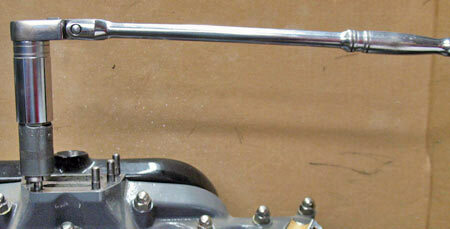 The holder-collet is tightened against the stud using box end wrenches (Photo 4). 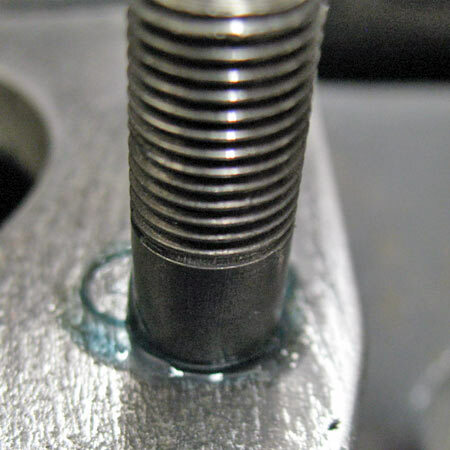 A few drops of Loctite thread locking compound is applied to the first few threads of the stud (Photo 5). Adding the thread locking compound prevents the stud from loosening. Start by hand tightening the holder into the manifold's hole and continue by hand until you are sure the stud is not cross threaded. Continue to twist the stud into place using either a box end wrench or the preferred method of a ratchet and deep socket (Photo 6). Pay attention to the amount the stud is inserted (setting the depth). 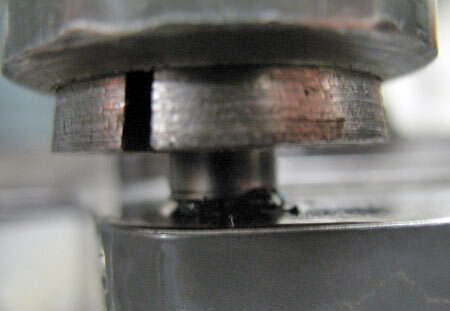 Counting the number of threads exposed (like 1 or 2) is one method while tightening the stud into place (Photo 7). Photo 8 shows the holder being removed off the stud using box end wrenches which reveals a small amount of thread locker that wept out the hole. Remove any excess. (Photo 9). Depending on the application, it may be critical to have the stud's height to a specific dimension. Check using a caliber and adjust as needed (Photo 10). 1. Gripping the threads and seating the stud without marring up the side of the stud is clearly an advantage. 2. You must have ample room to use the stud remover. Trying to use a stud remover in tight spaces can be frustrating. Photo 1 — The stud remover and reinserting kit from Snap-On Tools. On the left is the collet holder and on the right are the assortment of collets in both coarse (USS) and fine (SAE) thread sizes from 1/4 inch up to 1/2 inch. Photo 2 — This is a special manifold that has both intake and water passages. Some of the studs have been inserted. Photo 3 — A 3/8-16 X 3/8-24 stud is inserted into the holder-collet. This is a good example where a stud is both coarse and fine thread. Photo 4 — The holder and collet are tightened using box end wrenches. 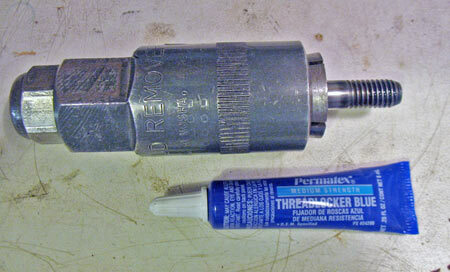 The holder's body has a 1 1/8 inch wrench size and the tightening nut is 7/8. 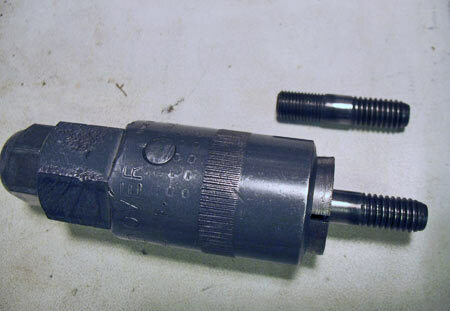 A ratchet-socket could have been used for the 7/8 tightening nut. Photo 5 — A few drops of Loctitie thread locker is applied to the stud's threads before inserting into the manifolds threaded hole. 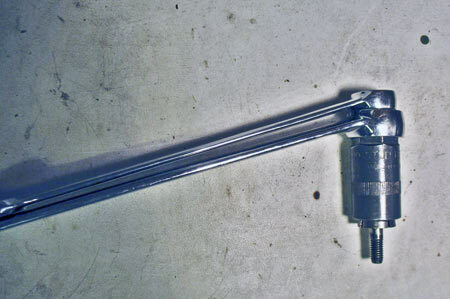 Photo 6 — Tightening the stud (holder-collet) can be accomplished using the box end wrench or in this example a 1/2 drive deep socket is used. It is important to use both hands to perform this procedure, one hand on the holder and the other at the end of the ratchet (wrench). Intent here is to prevent the stud from bending. Photo 7 — Each stud must be reinserted to the proper depth. Photo 8 — Release the holder-collet from the stud using box end wrenches. Photo 9 — Remove any excess thread locking compound before it dries. Photo 10 — Check final stud height with a dial caliber and adjust as necessary.